Guava is the color of my jacket and small evening bag. Black provides a neutral background for this date night look. Lipstick must match a red(ish) top exactly. 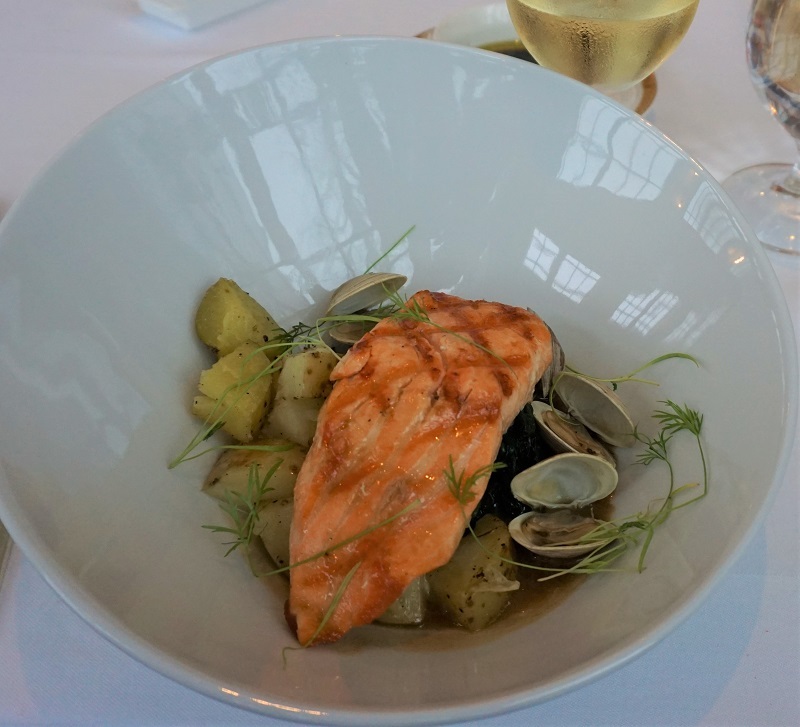 “Girls’ Night – Classic Red” hit the mark. (Lipstick here) One of the subjects you asked for repeatedly last week, was skincare tips and routines. Skincare has taken priority over makeup as I have aged. I am currently using a regime that includes Overnight Resurfacing Peel here. The Rejuvenating Regimen has all the appropriate products (day and night) for my now dry mature skin. I also use Countersun Mineral Sunscreen here. Cleansing Balm is my favorite way to take off the makeup and pollutants from the day. In addition to lip color, I am wearing a gray brow pencil, a bit of taupe eye shadow, charcoal eyeliner at the base of the top lashes only (smudged and softened with charcoal eye shadow.) There is a bit of rose blush on the cheeks and black mascara. That’s it for makeup. 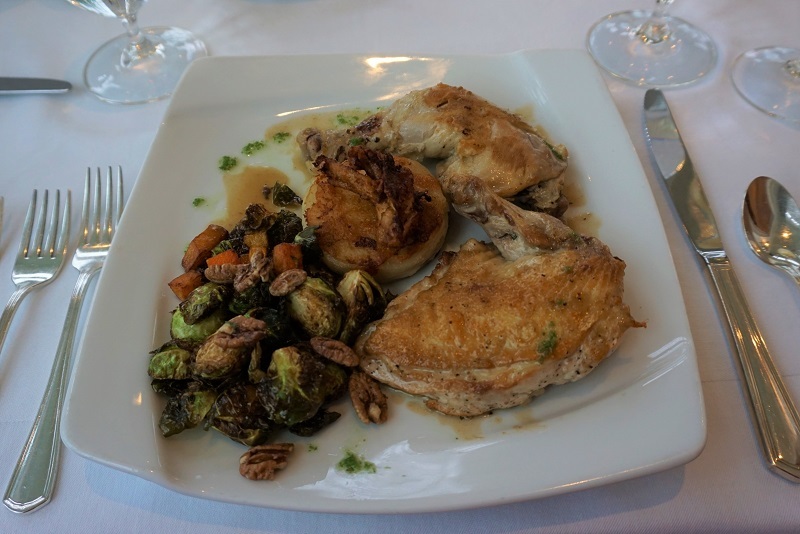 We spent Saturday in Blowing Rock, NC to enjoy another lovely meal at Rowland’s in Westglow. I can never overemphasize the importance of food choices in any skincare routine. Without essential healthy fats and omega oils, our skin will quickly lose elasticity. Mr. Mickey had salmon (above) I had the Tarragon Chicken thighs below with help from Mr. Mickey. I rarely finish all the food served. I drink more than eight glasses of filtered water daily. Another request that came very often last week was one for exercise routines. I go for brisk walks as often as possible, climb steps (two at a time) many times each day and park far away from the buildings I visit. I avoid sitting for long periods, but I do not go to a gym or do a set routine. 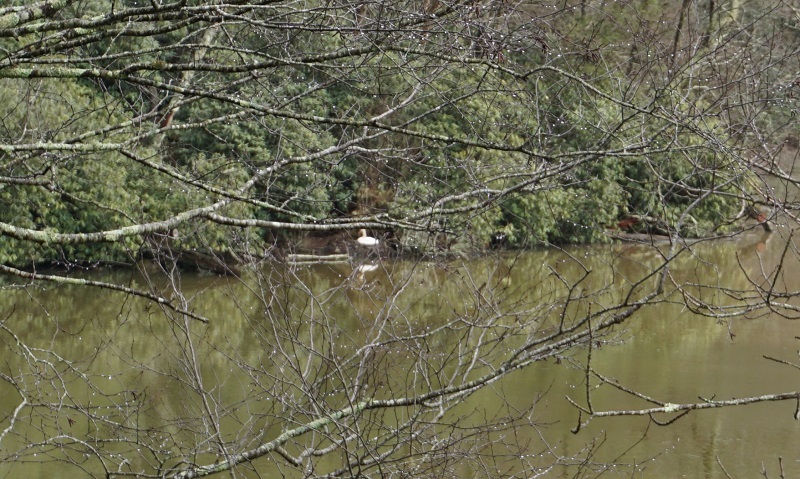 That’s a swan (!) sitting on a colossal nest behind me. (We couldn’t zoom any closer.) I do love spring! Love your blog. Simplicity has been my goal as I age. Hi Susan. Love this look. Would you please post something about the moto jacket? Brand, etc? Looks great on you! How do you handle bra straps under a cami with spaghetti straps? I love how you have adapted neutrals perfect for your coloring, Susan. I am struggling to refine the neutral, base colors for my wardrobe. Any suggestions you may have to help your fans determine a personal formula to create their base colors would be so helpful. Getting older seems to soften the overall coloring eliminating both light and dark tones. Medium toned hues seem to be the best for me but how do I create the basics out of this? Your tips and suggestions are always so appreciated. Thank you for sharing so generously. If black was once your base, you might find that charcoal or navy is more flattering now. If white was once your light neutral, pale gray may now be a more flattering choice for you. If red was once your bright, perhaps coral, melon, or rose will be your new bright. The colors you wore and loved in your youth are still your best colors, but now with a bit of frosty white added in to soften them. 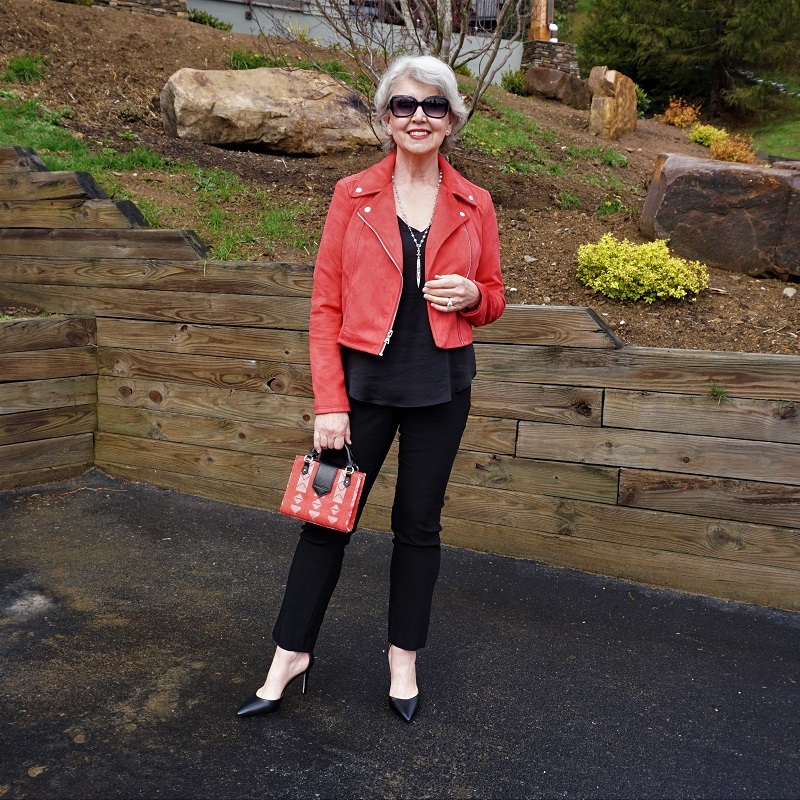 Both the lipstick and the reddish jacket are colors that really work well on you. In fact, it’s as pretty on you as the robust blue that you favor which also looks amazing . You are rockin it. Thank you, Susan…yikes! My husband interrupted my thought process and I neglected to mention my coloring is warm autumn. I’ve never been able to rock black, grays, navy, etc. aging has moved me from dark, beautiful, rich browns; tan colors are very dull on my coloring. My best color is green (I can’t imagine a base wardrobe in this color however). My style of dressing is similar to yours, simple, clean columns, little or no prints, a jacket or accessories providing color. My best colors really don’t lend themselves to base neutrals, green, teal, oxblood in the winter, pumpkin, peach, (you get it). Perhaps there are other autumn color lovers facing my delima as we move forward in our stylish lives. You might try looking at “warm spring” palettes. . . They are softer and may work better with your coloring now. Check Pinterest. Thanks, Maria, I will investigate this also–same problem-strawberry blonde hair and light topaz eyes. All the colors that used to look good, now aren’t quite right. Especially makeup colors! After being puzzled by the “autumn” palette, I found “warm spring” to be a real revelation. I’m fair, blue eyes, light/golden hair (now dyed…). It certainly works for me near my face. Definitely a very lovely colour on you, Susan! Your lifestyle tips are also quite helpful. You once mentioned that eating cheese causes your face to look puffy. I would have never thought of this, but now that I’ve kept an eye on it, I find it’s very true for me. I don’t eat cheese often, but now I know to avoid it before an important event, especially if there will be photos. Thank you for sharing. Walking is a pleasant way to exercise, but for anyone with hip/joint problems, stair climbing is not recommended for exercise. My physiotherapist explained it very well, but I’m not sure I could explain it clearly here. (I don’t say this to correct you, but rather in case someone should read this and learn from my mistakes ). I agree! We should pay attention to the needs of our unique bodies. Sometimes we are unaware that food, posture, exercise or even the way we sit at our desk can be the culprit that is causing us problems. Love, love, love that color on you. The bag is just darling. I think guava or coral is a perfect color to warm up the skin. So flattering. What brand pencil do you use that is gray brown? Need this exact color with my silver hair and fair skin. The brow pencil I use is DEFINITIVE™ BROW PENCIL in taupe from Merle Norman. Hi Susan. I love the colour of your jacket and bag. I tend to always wear a neutral coloured lipstick which is fairly close to my real lip colour. Goes with anything. I’m so glad to hear you say that. I’ve always felt a red lip had to exactly match my outfit. Now I don’t feel guilty about my 15 slightly different red lipsticks. 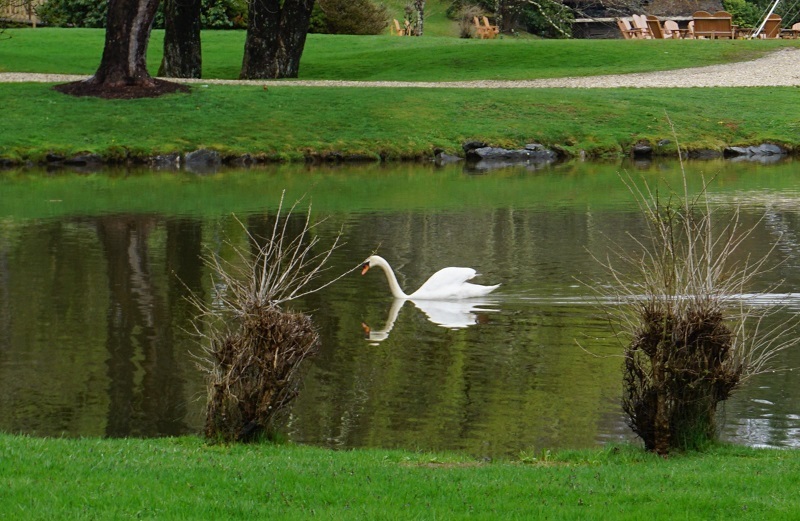 Oh the pictures of the white swan and the flowers! 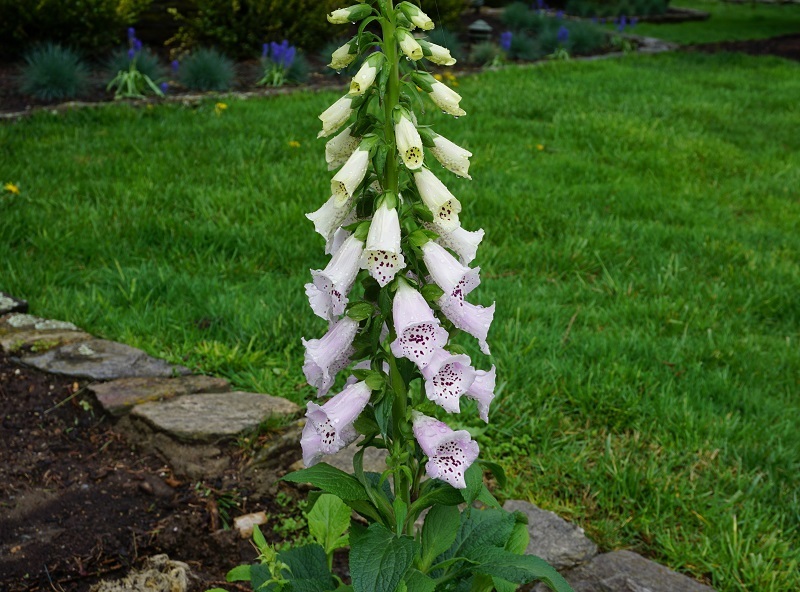 Foxglove has always intrigued me. 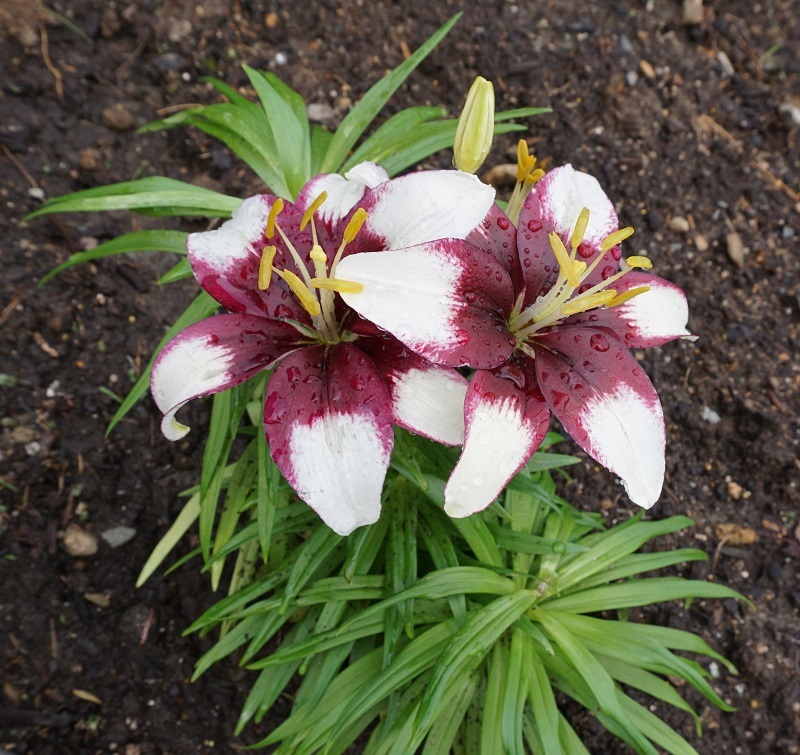 They are tricky to grow and I have to transplant them twice! Beautiful outfit. Thank you for giving us examples if ideas to aim for! 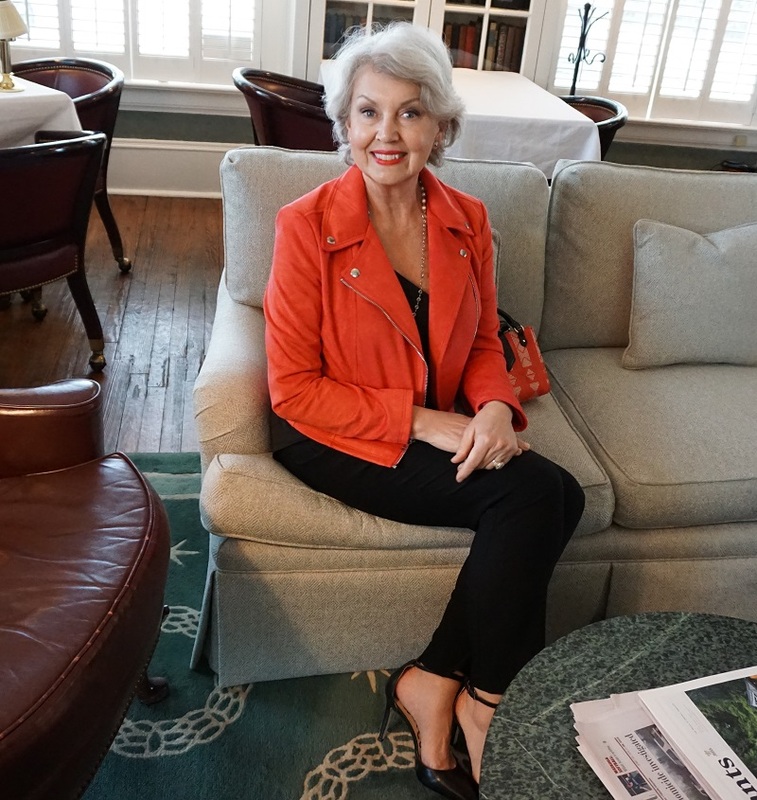 I love seeing you all put together for your date nights and other outings but what do you wear around the house. 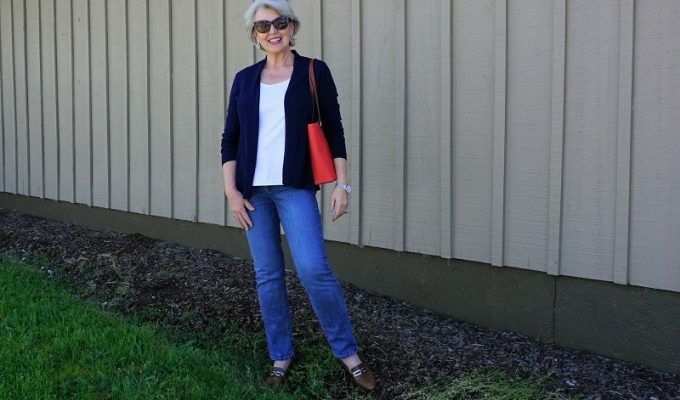 I wear jeans, and a sweater or soft knit top or shirt with the sleeves rolled up. My shoes are slip-on sneakers or sandals when I am home. So pretty! I really enjoy your site. Hello Susan! You look gorgeous! Those colors look so good on you. You mentioned the Rejuvenating Regimen that you use day and night but I notice that a night cream is not part of the set. Am I to understand that you use the day cream at night? Thank you for sharing! You can if you wish. I avoid night creams because I tend to have breakouts if I use them. There is a Rejuvenating Night Cream here. Hi Susan! Love this outfit and I confess that I still prefer the high heels to wearing all flats. Looks dressier and sexier. I know heels for all occasions is impractical, but nice when we want to step it up a bit. 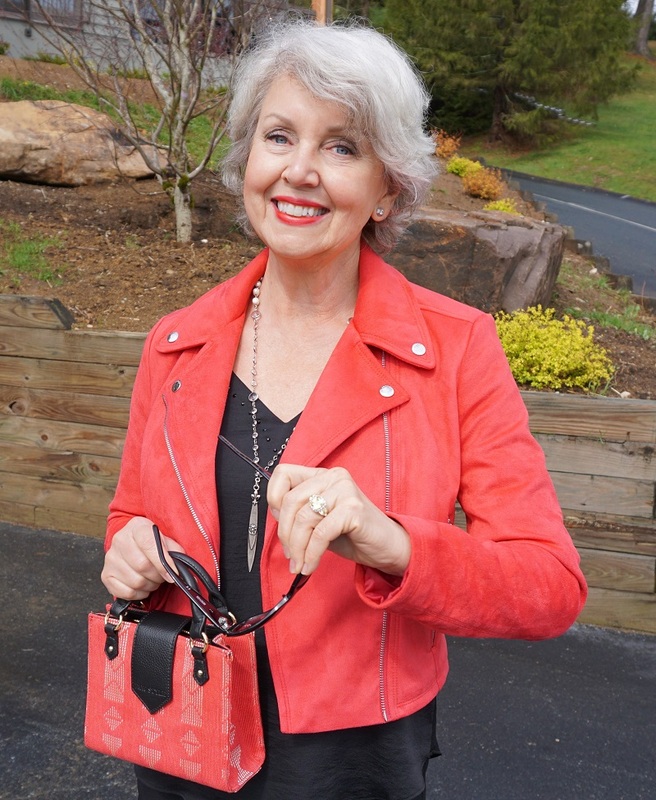 I tend to do black and white a lot, so the coral with black never occurred to me, and it looks fabulous on you! Another thing I study in your pictures is how you pose which always looks great. Any tips on posing for pictures for the best outcome would be greatly appreciated!! I hope you can find them in another boutique. Yon Designs in Ft Lauderdale, Florida produced the clothing line. I second the request from Janet Mcrae — Any tips on posing for pictures for the best outcome would be greatly appreciated. Here is a post I did on my old blog about posing for pictures. My question is about bra. What’s the name of the whole bra, and where do you get them? The bra is by Shapeez.com and the style I wear most often is the Ultimate. I am trying to get into the habit of drinking water as I don’t drink any water.You mentioned that you drink filtered water. Would a Britta pitcher do the job? Thank you! 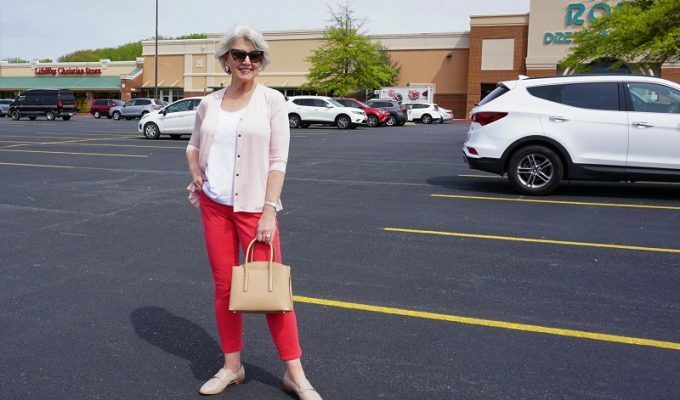 Susan: You have an adorable figure and know how to dress for “someone your age.” I am looking for linen pants for summer and it seems everything is wide leg, cropped and tied at the waist. Would you wear wide leg, cropped and tied at the waist pants. Susan, you alway look beautiful! 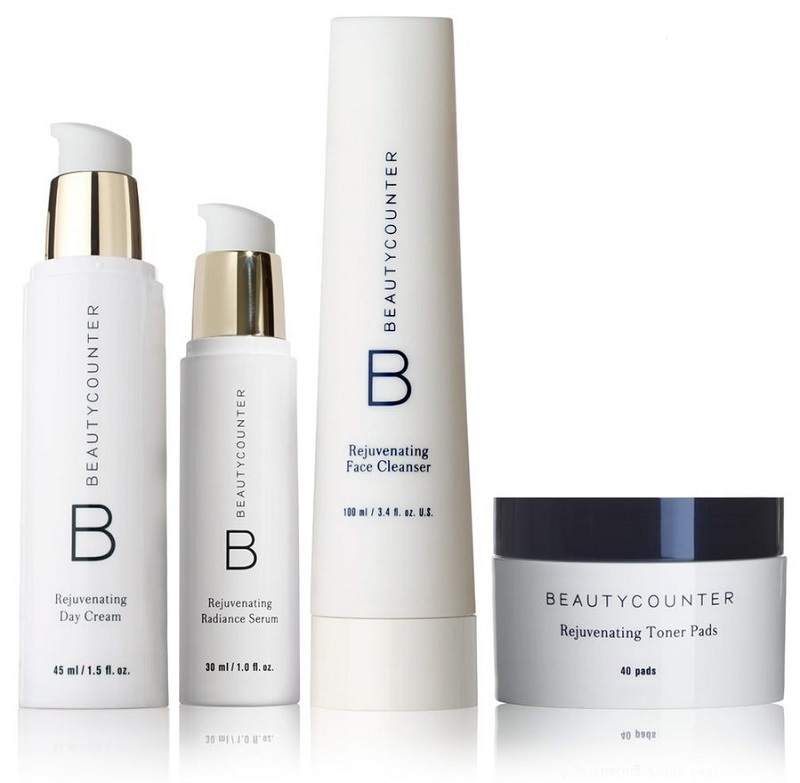 I’ve been wanting to try Beauty Counter skin care. Even at 60, I have an oily t-zone. I’ve never had dry skin. What products would you suggest? Thanks for all your helpful tips! The Countercontrol Collection might be the best choice for you. If you still have breakouts it will help with that as well. I don’t have breakouts, just oily, especially forehead. Do you still think this collection is what I need? Thanks for your help! Yes. It will give you a more matte appearance. Interesting that you recommend matching your lipstick to your top while most say you shouldn’t. I tend to agree with those who suggest going a couple of shades darker with the lipstick. Be careful with dark lipstick and lining your eyes on the top and the bottom. Doing this makes the lips and eyes look smaller. I just received the guava jacket and it is beautiful. Finding comfortable jackets has always been a problem for me—thank you for your recommendations!!!!! I’m so glad you like it. Enjoy! Hi Julie! The link to my breakfast porridge as well as some of the lunches I enjoy are all included here.